Police responded to several illegal acts, including battery of a peace officer and a parole violation, at a rock concert at the Hearst Greek Theatre, above, on Saturday. UCPD responded to several illegal acts at a rock concert at the Hearst Greek Theatre this past Saturday evening, though the department said none were particularly raucous or unusual. Among the incidents were an arrest for alleged battery of a peace officer and several citations for alleged public drunkenness as fans gathered for a performance of metal band A Perfect Circle. UCPD Captain Margo Bennett was also clear in pointing out that the events were not indicative of a trend. The night of the concert, there were four separate listings for illegal acts on the UCPD crime logs — which was not “problematic, but active” Bennett said. The parole violation occurred at about 9:56 p.m., almost two hours into the concert. Although the specific violation was not listed and Bennett could not comment on the detail, upon arrest, the suspect resisted and gave the attending officer a hand injury, adding the charge of battery of a peace officer, she said. At this particular concert, there was not any additional staff, nor was there any extra action taken on behalf of the UCPD to ramp up security — the show was not deemed to have been “a bad concert in the sense of public safety,” according to Bennett. A Perfect Circle was formed in 1999 by two former members of a different alternative band as well as several other instrumentalists. The concert last weekend was part of the band’s reunion tour after a seven-year hiatus. In general, bands playing at the Greek Theatre do not have a significant impact on crime in the area, according to Berkeley Police Department spokesperson Sgt. Mary Kusmiss. 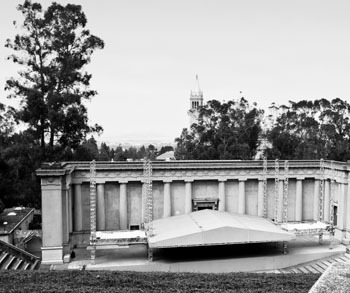 While the concert this past weekend was not considered to be troublesome for UCPD, the Berkeley Police Department or the community at large, there have been more severe spikes in crime associated with other acts at the Greek Theatre in the past. When the popular jam band Phish and its devoted “phans” came to Berkeley to play at the Greek last August, there were 12 instances of public urination, two unauthorized public fires, one arrest for battery against a peace officer, six arrests for drug possession and sales and an unauthorized campsite. In that instance, drugs including marijuana, ecstasy, methamphetamines, cocaine and psylocibin were found among attendees, in addition to the exclusion of eight people from the UC Berkeley campus. Over 20 people were given field interviews for possible alcohol violations — in contrast to the handful of alcohol-related citations at the A Perfect Circle concert.